Mommy. Momma. Mom. Whatever moniker you go by, this much is certain. You could use a healthy dose of encouragement and inspiration. Jean's style of teaching is humorous and peppered with personal experiences and practical life application. She has been there and done that. Both of her sons are grown and building their own households of faith. She draws on her own life experiences integrated with Biblical truth. Here is just what the doctor ordered. And we have several ways you can get your dose. 1. Starting September 17 Jean will be teaching MOMS at Bellevue Baptist Church. She is teaching the Book of Ephesians. Her study is entitled High Stepping in Heavenly Places. Nursery is available by reservation and we offer programming for home-schooled children. Click here for more information and registration. 2. You don't live anywhere near Memphis, you say. No worries. We do a live video stream at 10:45 CST on Thursdays, beginning Sept. 17th for 10 weeks in a row. Click here to watch the message live OR get information to access the archived messages. 3. On-line Bible studies. 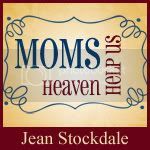 We have several MOMS who will be offering Jean's on-line Bible study for those who cannot attend MOMS in person. Check back for more details and sign-up. 4. PODSCASTS. We have PODCASTS of the Philippians series called Joy in the Journey available on the blog at no charge. 5. Bible study workbooks can be purchased by clicking here. Studies are perfect for individual Bible study, home study groups, or incorporated into your church's program. We are trying to reach as many MOMS as we can to offer practical advise and loads of encouragement - just what every MOM needs! And don't forget to check in as often as possible and leave us a comment. Tell us what God is teaching you as you parent the next generation. Blessings. Life is hard. Face it. It never gets easy. Nothing about it is easy. Relationships. Finances. Communication. Balancing the demands of life. Relaxing long enough to enjoy life. Keeping the plates spinning. Discerning the difference between the urgent and the important. And so on. So on. And on and on. You get the idea. The Lord does not deny that life is not without its challenges. He simply reminds us to lose our lives in Him and He will take care of the rest. How utterly simply. How often overlooked. Jesus said, "For this reason I say to you, do not be worried about your life, as to what you will eat or what you will drink; nor for your body, as to what you will put on. Is not life more than food, and the body more than clothing? Look at the birds of the air, that they do not sow, nor reap nor gather into barns, and yet your heavenly Father feeds them. Are you not worth much more than they? And who of you by being worried can add a single hour to his life ? And why are you worried about clothing ? Observe how the lilies of the field grow ; they do not toil nor do they spin, yet I say to you that not even Solomon in all his glory clothed himself like one of these. But if God so clothes the grass of the field, which is alive today and tomorrow is thrown into the furnace, will He not much more clothe you? You of little faith ! Do not worry then, saying, 'What will we eat?' or 'What will we drink?' or 'What will wear for clothing?' "For the Gentiles eagerly seek all these things ; for your heavenly Father knows that you need all these things. But seek first His kingdom and His righteousness, and all these things will be added to you. So do not worry about tomorrow ; for tomorrow will care for itself. Each day has enough trouble of its own (Matthew 6:-25-34). Sunday blessings for today and all week long. I asked my Facebook friends to send me their addresses of their blogs. I want to do a Roll Call of sorts to showcase what some great Christian woman on doing on the blogosphere. Check them out. 1. My buddy Kristen blogs at The Taylor Dream. Check out her blog about the intersection of her faith and family. She posts pictures of her darling family and writes about her personal journey with the Lord Jesus Christ. Stop by. 2. Shannon's blog is called 5 Petersons. She is married to her high-school sweetheart (just like me and Craig!) and a momma of 3 little ones. She chronicles her lively adventure of mothering on her precious blog. Click over and get some inspiration from Shannon. 3. Michelle is a blogger at Little Corner of the World. She is married with one daughter and one son. She is a busy lady building her household of faith. She is an avid readers and posts reviews of what she is reading. Stop by and visit with her when you get a moment. 4. My buddy, Amy, blog at Wonderfully Made. She weaves her journey with the Lord and her devotional life in her poignant blogs. For more about her family life you can click here and see her second blog called This Abundant Life. She writes 2 blogs! I am quite envious of her discipline. I do good to keep one up-to-date. When Amy and her family lived in Memphis she served in leadership in the MOMS Bible study that I teach. We stay connected through FaceBook and the blogs. 4. Becky is a wife and mom to 2 little dolls, Ally and Claire. Her blog is Lollar's Little Ladybugs. I met Becky through Bible study. Becky attends the MOMS Bible study I teach and has a great for the things of the Lord. She writes about her walk with the Lord, her family, and her faith. Make a point to stop by and visit with her. You won't be sorry! She has a cottage industry making hair bows. Click here for her "bowtique" website. 5. My sweet friend Wendy blogs at Mommy Times Four. Wendy is one of the small group leaders for my MOMS Bible study. She loves the Lord and is passionate about her faith and family. She and hubby, Matt, have 4 babies under the age of 5! So you know she has some tales to tell. Wendy blogs with great candor about the ups and downs of motherhood balanced with her desire to be a godly wife and mom. Wendy also designs and sells her own stationary (and more)in her cottage industry, Duck Duck Goose. Check out her online store here and her Etsy store here to see her darling creations. I have one of Wendy's designs and she is awesome. 6. My sweet little Sugar and Spice Mommy is named Ashley. Ashley blogs about her darling family and her dynamic faith. This young mom also attends my MOMS Bible study and has a heart that is totally committed to Jesus Christ. She loves her little kiddos and is building a household of faith with her sweet husband. Ashley also has a cottage industry making gorgeous stationary and stickers. Check out her online store by clicking here. I have purchased stationary and stickers from her and love them. One sticker says, "This book belongs to Jean Stockdale" and one is a gift tag that says "This gift is from Jean Stockdale." Love it! My sister came in town last week and we took my mom to the zoo. I had forgotten how much I love to watch the animals. Like this polar bear named Cranbarry swimming past the observation deck. Up close and personal with a polar bear. Now that is one of the Finer Things in Life. For more Finer Things Friday, click here and visit with Amy and her friends. Is it Friday already? This week has flown by. It is already time to play Aloha Friday. Welcome to this week’s edition of Aloha Friday. In Hawaii, Aloha Friday is the day that the Islanders take it easy and look forward to the weekend. In that tradition, Island Life is hosting a meme called Aloha Friday. If you’d like to participate, leave your answer to my question in the comment section. Then just post your own question on your blog and leave your link to your Aloha Friday blog post by clicking here and going to The Island Life. Don’t forget to visit the other participants! It’s a great way to make new bloggy friends! Mine is: "Elvis is dead and I don't feel so good either." If you are not from Memphis, TN. this may not be funny to you, but since I have lived most of my life in the home of the man known as The King of Rock and Roll . . . well, that is just plain funny. After Elvis' death there was much speculation about his death. Many claimed Elvis was not dead; he was merely in hiding. Seriously? Hiding? This well-known specualtion is what made that bumper sticker so funny to me. How 'bout you? What is your favorite bumper sticker? Leave your comment and thanks in advance. Oh, and how 'bout playing 5 Things Friday and make a post for your 5 Favorite Desserts or Candy. Welcome to my Typepad blog home! I am a Christian wife, mom to 2 grown men who are building their own households of faith, and a grand to 2 adorable little guys. In 2006 I founded a Christian ministry called Standing Near the Cross Ministries. 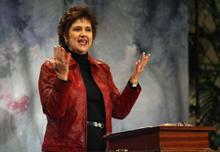 I am a Christian author, Bible teacher and women's speaker. Click here to read more of my story and click here to read what I believe. You can follow me by subscribing to my Blog and on Facebook, Twitter and Networked Blogs. Please become a fan and become a member of my blog community. I write, publish, and produce Video Driven Bible studies and accompanying DVDS for MOMS. For further information about my Bible studies click here to go to my website or call us at 1.877.409.5564. Okay. I get it. I know it. My banner does not fit my blog. I am trying to resize it. Trying and trying. But I declare, my friend Typepad and I are having some issues. Now I know I have not done everything right in this relationship. I know I have been distant at times. I have given you the silent treatment . . . the cold shoulder. You have bristled at my disinterest. Let's be honest. You are at least partly to blame. You have not always responded well. And you have done some mean things. You have acted out. You have made posts disappear. Paragraph have been compressed . Run-on sentences, which are my signature , have received your disdain. So I get it. You are mad at me. You don't like the ways I do things. But cut me some slack! I am a writer, not a techie. I got plenty of words. And I share them with you regularly. Couldn't you at least do you part? Make my blog look right, for heaven's sake. Is it so hard? Is it too much to ask of you? I think not! So please. Pretty please. Fix my banner. Make it fit the blog. Configure the stinking pixels. Conform the stupid heading. Calculate the whatever-you-call-them and get this right. Work with me. Please. You are making me look bad in the blogosphere. What's ya say? Can we make-up and be friends again? To all my sweet bloggy friends, I am trying to get my blog right. I am working to get my banner resized and my blog to look right. If anyone out there uses Typepad and would like to give me any advice on using it, I would be thrilled to hear what you have to say. I am sure the problem is operator issues. I get it. But if anyone has a source of info to make Typepad a bit more user friendly for non-techie writers, well I could use the help. Blessings, my bloggy friends. Have a glorious day out there in the blogosphere. So what do I love? Lots and lots of things. For the sake of time I will narrow it down to one. One thing that I love. Just one. I love hugs. A hug is one of the quickest ways to show affection. I caught this moment after church. Jason has just finished leading in praise and worship. Declan (in the green shirt) rushed up to hug his daddy and just as Jason squatted down to get a hug, Kate McDade and Little Girl Benjamin rushed in. A hug. A hug is one of the quickest ways to show affection. Hugs. Could you use one? For more Things I Love Thursday click here. And don't forget to stop by and play 5 Things Friday with me. Blessings. For more Word Filled Wednesday, click here and be blessed! What did I tell you about me and baby animals?!?!? Imagine my delight to see mom and her baby giraffe and, I assume, her auntie! Good times. For more Wordful Wednesday, click here. And don't forget to come back and play 5 Things Friday with me. This week is 5 Favorite Desserts or Candy. Blessings. For More Wordless Wednesday click here and go to 5 Minutes for MOMS or click here. Don't forget to stop back by and play 5 Things Friday. The list is 5 Favorite Desserts or Candy. Combine and chill at least 3 hours before serving. I am not sure how this recipe got named "Watergate Salad". That does not seem policially correct to me, but this is the way it was given to me. This is one of my favorite quick salads. Since you don't actually make the Jello, your only use it for flavoring, it could not be easier. Try it. You and your family will love it! For other great recipes, click here to go to Blessed with Grace. Tasty Tuesday recipes can be shared by clicking here. And on Foodie Friday at Designs by Gollum you will find some great cooks gathering. All these blogs do a great job linking us with great cooks and wonderful recipes. Don't forget to stop back by and play 5 Things Friday. It is a great way to get to know some new bloggers. Blessings. MOMS. I have good news for you! Read the following excerpt*. Beloved mom, I have good news for you. Jesus loves you. He tasted death to give you life. Not just life, Jesus came to give you a life full of joy and meaning. Jesus says, I came that they may have life, and have it abundantly (John 10:10). At the moment of conversion, you and I were placed in Christ. We have been made heirs of God and fellow heirs with Christ (Rom. 8:17). Now that is good news! *Excerpt from Joy in the Journey, the Bible study I have written for MOMS. MOMS, could you use some more words of encouragement? Podcasts of this study are available by clicking here. Accompanying workbooks are available by clicking here. I did not open a Diet Coke, or in some cases, a Diet Pepsi. Drink part of it. Not finish it. Put the opened can in the fridge. And open another. Drink. Not finish it. Put the opened can in the fridge. And then open another. Drink. Not finish it. Put the opened can in the fridge. I did not do that. Over and Over again. I did not. NO. NOT ME. I did not. For more Not Me Monday or Not My Child Monday, click here. And don't forget to stop by and play 5 Things Friday with me. On Friday my mom and I took my sister to the Overton Park Zoo. My sister and brother in law is visiting from Louisiana. Memphis is August is usually unbearably hot and humid but a recent series of random thunderstorms has cooled things down here in the South. So we ventured out to the Zoo to see a new exhibit called The Birds and the Bees. Clever, uh? Well, here are some pictures of our trip. My sister is feeding a feathered friend. My mom joined in the fun. A close-up of one of the bird friends. A fine time was had by all! If you have not been to the Memphis Zoo in a while, you simply must make plans to go. The Birds and the Bees exhibit will be closed in September. A new section of the Zoo will be opening in October to showcase elk, black bears, and cranes. This exhibit will highlight the wildlife of the Grand Tetons part of the country. We all enjoyed our day at the Zoo. Hope you will take the time to check it out sometime soon. Blessings.